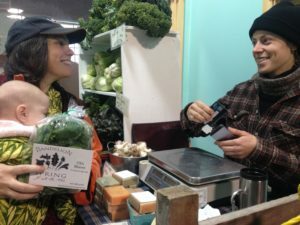 There are many ways that your market can increase food access for low-income community members. The Supplemental Nutrition Assistance Program (SNAP, previously known as food stamps), the Special Supplemental Nutrition Program for Women, Infants and Children (WIC), nutrition incentives, the Senior Farm Share Program, and after-market gleaning are all great options. This page provides more information and resources about each of these programs and ways that you can incorporate them into your market. New resources are consistently being added to this page so check back frequently and contact us with any questions: SNAP@mffm.org, (207) 487-7114. SNAP = Supplemental Nutrition Assistance Program, a federally funded government program which has traditionally been known as “food stamps” and is restricted to food purchases. SNAP-eligible food items include: Baked goods, breads and cereals; jams, jellies, pickles, honey, maple syrup; fruits and vegetables; meats, fish and poultry; cheeses, eggs, dairy products; seeds and vegetable plants which will produce food to eat; edible pumpkins, cider. Non-eligible food items include: Pet foods; soaps, cosmetics, paper products; animal fleece, yarns; crafts; prepared hot foods; vitamins and medicines; live animals; inedible gourds or pumpkins used for decorations; any food that is intended for on-site consumption (i.e. ice cream cone, hot cup of soup); flowers; inedible plants. SNAP RESOURCE: Here’s a 1-page summary of SNAP facts. EBT = Electronic Benefit Transfer, the method in which SNAP and other government assistance funds are given to the recipient. Funds are added monthly and the card works similar to a debit card. 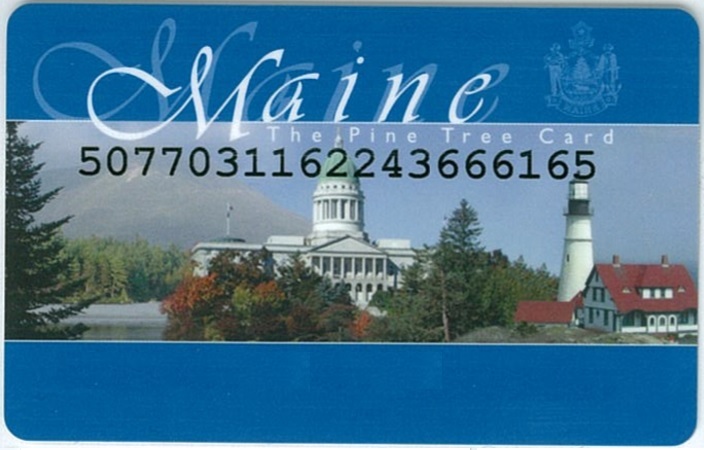 In Maine, the EBT card is called the Pine Tree Card. Funds other than SNAP, such as Temporary Assistance for Needy Families (TANF) or child support, can be loaded onto an EBT card so in addition to food-restricted SNAP, customers may have cash benefits on their EBT card. EBT benefits are processed using QUEST network, similar to a credit/debit card processor. 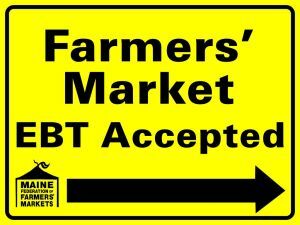 How does SNAP/EBT work at a farmers’ market? A market that wants to provide SNAP access to all eligible-food vendors must have a central EBT terminal where SNAP transactions take place. This requires a system that allows customers to then shop at multiple vendors but only swipe their card once. Some markets (typically larger in size) have a market SNAP scrip such as tokens or vouchers that is exchanged for the dollar amount swiped on an EBT card. 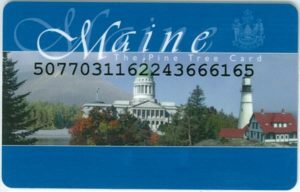 The majority of markets in Maine (small to mid-sized) operate with a shopping sheet system which allows customers to have their purchases tallied by various vendors on an official form that is then returned to the central terminal to total the sale and complete the transaction. Incentivize: Consider offering SNAP customers an extra incentive to shop local despite a limited food budget (average SNAP received per person is $4/day). Incentive programs can operate – and be funded – in many different ways with the common goal of making a market more accessible and attractive to SNAP (and/or WIC) recipients. “How to Run a Nutrition Incentive Program,” a toolkit from Wholesome Wave available here, is a useful resource to learn more about incentives. We are always available to discuss your market’s incentive program and provide examples of how such programs operate elsewhere: SNAP@mffm.org, (207) 487-7114. 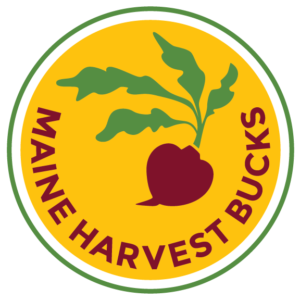 Click here to learn more about the Maine Harvest Bucks SNAP nutrition incentive program currently operating at dozens of farmers’ markets and other market types throughout the state. This federally funded, locally supported program provides fruit and vegetable bonus bucks to SNAP shoppers to help stretch limited dollars and encourage healthy food choices. Record-keeping templates and tools are available. If needed, ask us for help arranging spreadsheets. Just ask! *We can also store SNAP records safely in our office if your market does not have a good storage option. Special link: How to order & use manual vouchers (when the EBT Device won’t work).